344-rooms, 425-acres... oh, and a race track. Now the site could grow into a "unique automotive resort" after plans for a 344-room hotel were submitted. 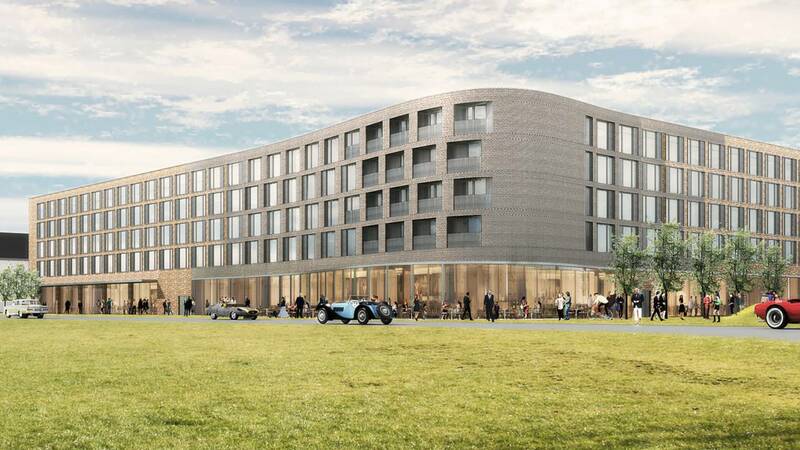 The hotel will feature expanded steel mesh covering the curve of the building in homage to RAF Bicester’s past as a camouflage training center. The design of the building will follow the lines of adjacent hangars but it will have a contemporary design. The hotel will have a top-tier restaurant, bar, courtyard, gym, swimming pool and sauna, and it will offer an immersive experience for car enthusiasts, featuring cars of the past, present, and the future. The Hotel's four-storey atrium will also showcase rotating automotive themed exhibitions and displays. In case you're wondering, yes hotel guests will get access to Bicester Heritage's track. "We very much look forward to welcoming enthusiasts to our motoring hotel, from which they will be able to experience a range of automotive destinations on a single site, from the existing centre of excellence for historic motorcars to private track, exhibition hangars, OEM brand centre and future technology," said Dan Geoghegan, Managing Director of Bicester Heritage. "Hospitality specialist architects and interior designers, Dexter Moren Associates, are thrilled to have been selected to design a landmark hotel within a former RAF base, forming part of the Bicester Heritage master plan vision focusing on motorcars and aeroplanes," said Moren. "The design objective has been to respond in a contemporary manner to the site’s rich and unique story, drawing inspiration from its historic position at the forefront of aviation, engineering, and innovation while complementing the existing period buildings."